Sanora Babb experienced pioneer life in a one-room dugout, eye-level with the land that supported, tormented and beguiled her; where her family fought for their lives against drought, crop-failure, starvation, and almost unfathomless loneliness. Learning to read from newspapers that lined the dugout' s dirt walls, she grew up to be a journalist, then a writer of unforgettable books about the Great Depression and the Dust Bowl, most notably Whose Names Are Unknown. The author was seven when her parents began to homestead an isolated 320-acre farm on the western plains. She tells the story through her eyes as a sensitive, fearless young girl who came to love the wind, the vastness, the mystery and magic in the ordinary. 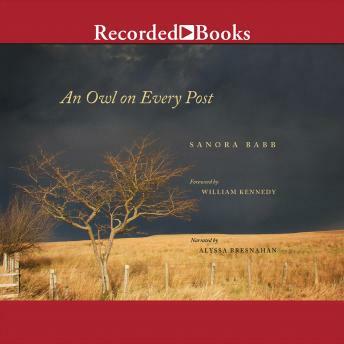 This evocative memoir of a pioneer childhood on the Great Plains is written with the lyricism and sensitivity that distinguishes all of Sanora Babb' s writing. An Owl on Every Post, with its environmental disasters, extreme weather, mortgage foreclosures, and harsh living conditions, resonates as much today as when it first appeared.